The medicinal UK market is one of the front-runners in the world, due to both early internet adoption and regulations not requiring the patients to meet their doctor to get a prescription for medicine. The amount of internet pharmacies available grew quickly in numbers and the market became mature enough to embrace this new buying habit. Considering the amount of competition in todays e-commerce landscape - better, faster, secure and more discreet services becomes the new norm. Services like Ubermeds will disrupt the current service model by offering more to the customer than the competition does. We often say that medicine is available around the corner, which technically could be true but we need to better define what available means. You can get a prescription from a practitioner, go to a pharmacy and buy your medicine but it’s a rather long process you might not want to call “readily available”. A while back I worked with a company called Treated.com where we revolutionized the shopping experience of medicine. Patients were able to sign up, get a prescription and order medicine online quick and discreet. This solved a lot of the hassle involved with regular pharmacies because you no longer had to go somewhere to get your medication - instead it was sent home to you. But what happens when you’re playing with your kids, taking a walk with your dog or spend time with loved ones in a restaurant and suddenly realize that you forgot your inhaler at home? Or what if you’re abroad and you need a certain type of medication but you don’t really know where the closest pharmacy is, or you lack the strength to go there yourself. We need to solve this potentially big problem, but also simplify the process of ordering medicine further by allowing delivery not only to your home, but to wherever you. 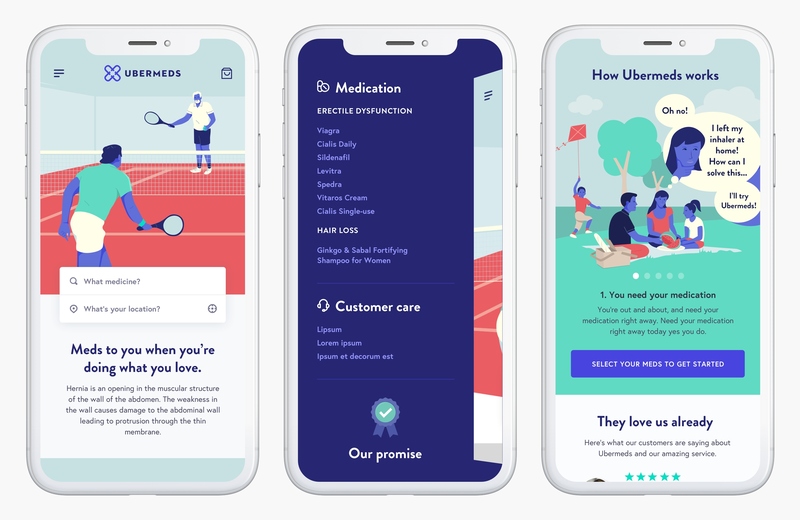 I worked alongside great creative minds and technical developers to create a platform for ordering medication online, where I focused on the usability and design aspect creating conceptual sketches and graphics that would later be picked up by the developers. The end result was an application that is available for similar companies today. Please contact me if you’re interested in running this for your business. The start page is focused around the lifestyle of our target groups, the meds and the location selector. 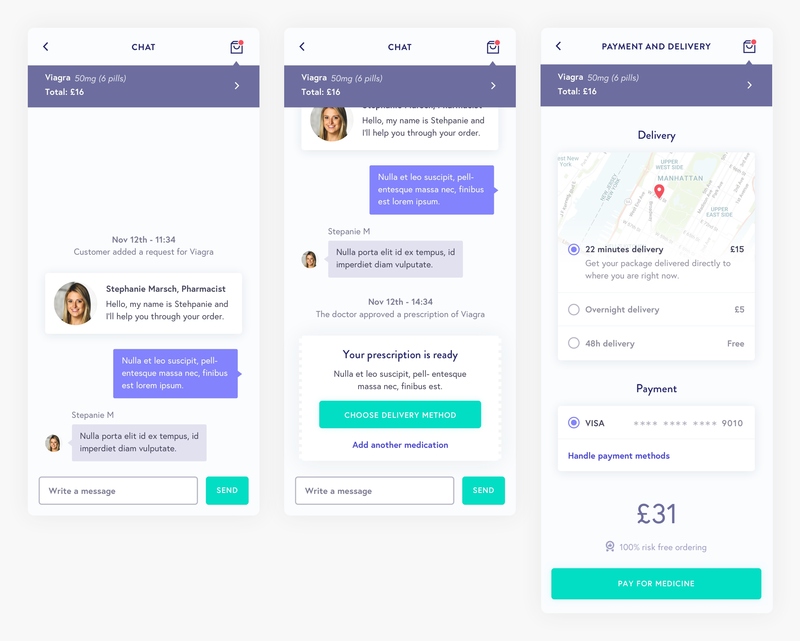 At the top we top we illustrate how the service physically work with beautiful and playful animations and a simple search field that serves as an introduction to the ordering process. Upon clicking the search medicine field an algorithm will calculate from most popular conditions and medicine alternatives, and as you start typing the list of results will change accordingly. The search functionality is free-text and matches on close to anything to make it as easy as possible for the customer to find what they are looking for. 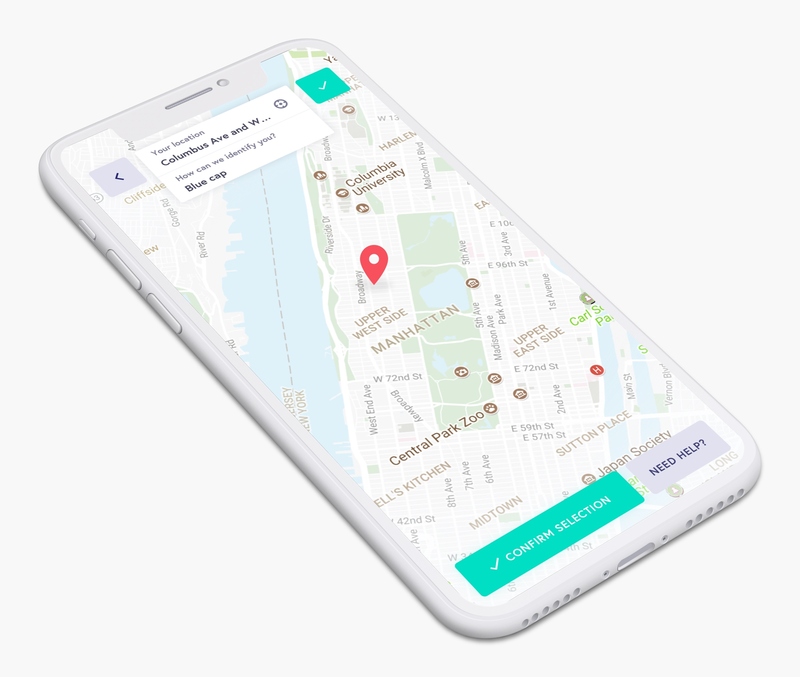 When it's time to select your location, the map relocates to your current position using the GPS functionality in your phone. You can then add add helpful indications for the delivery person to identify you if you're in a crowded place. If, at any time, you're unsure of any feature you can ask for help by using the need help button. If used, the customer is taken to a chat with a pharmacist. In order to purchase any products the user needs to sign up, and just like in most e-Commerce environment this would be done after the customer has shown intent of purchase. While doing the consultation we need to ask a few questions about the customer, and different answers requires different questions. After a study in how Ubermeds generally conducted these questionnaires when ordering e.g. Morning After Pills we managed to find a underlying structure where we identified different layouts for three different types of questions. 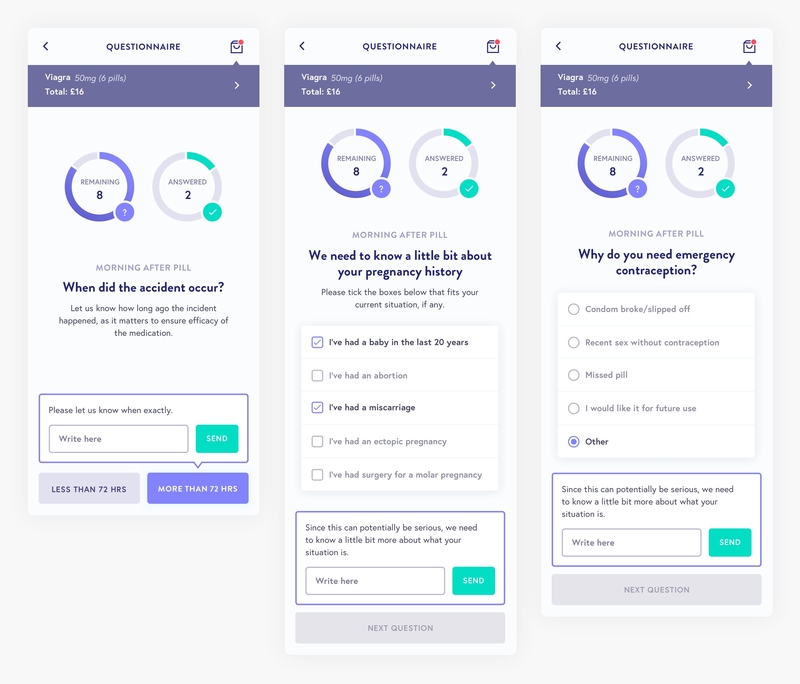 Each individual question may then require a free text answer from the user to clarify their choices. As mentioned previously the customer can at any time ask for help and be taken to a chat where the process would be handled manually. The idea is that the process should be as easy possible to avoid a lot of manual work at this point. Still, the customer needs to talk to a pharmacist representative to get the OK to proceed to payment and delivery. Thus this crucial step can involve many different people and serves as a hub where representatives can drop in and out of (privacy obviously thought of). Maybe it turns out that the requested medicine is not the best choice after filling in the medical questionnaire, thus another medicine would be suggested at this point. Or maybe the M.D. needs to step in and ask follow-up questions. It's a great place to handle most of the fringe-cases that may come up. 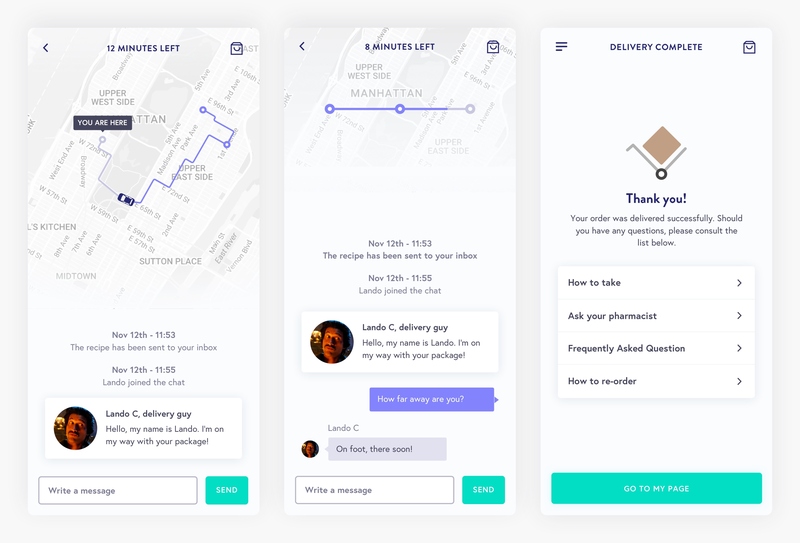 Similarly to other services you can see the delivery progress live, and you have the option to chat with the delivery guy the same way as you just chatted with the pharmacist and/or doctor. 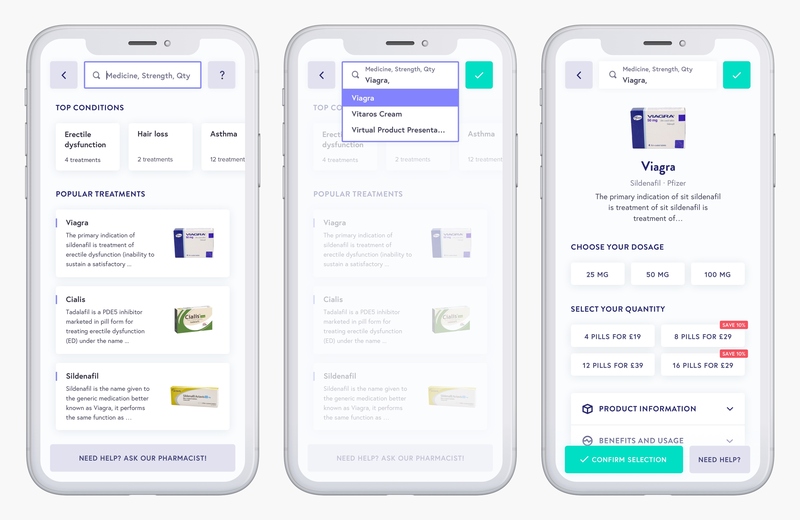 After the order is finalized, the customer is directed to their profile where they can see an overview of their prescriptions and previous orders.